© 2019 Palms Magazine/KEM Media Group, LLC. All rights reserved. 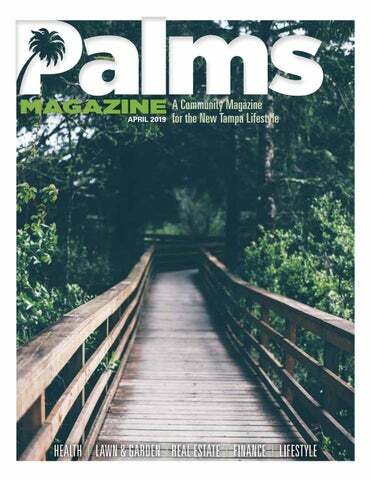 Palms Magazine is published monthly and direct mailed free to all residents of Tampa Palms and advertisers. Unless otherwise noted, the views expressed in this publication do not necessarily represent those of the Publisher. Tampa Palms Country Club logo used with permission. Lists are for reference only and do not imply official sanction or recommendation by Tampa Palms. Editorial submissions are welcome. Publisher reserves the right to reject or edit all submissions for length and clarity. The Publisher is not responsible for errors or omissions. Seek to keep your goals in mind and your portfolio one step ahead Together, we’ll take a fresh look at the opportunities that a changing world can provide. Call to learn more today. Shop a huge selection of new boats, fishing gear and more! We provide the jigs, tackle, and line for hands-on learning with expert anglers. CRPC® is a registered service mark of The College for Financial Planning. ADPA® is a registered service mark of The College for Financial Planning. Want to make sure your home sells quickly and at a great price? Here are a few things you can do to increase your chances: De-clutter and de-personalize. Getting rid of personal items s a homeowner, there may come a time when you ask yourself; should I buy a can help buyers better envision themselves in the home. new home, or stay put and renovate my old one? Invest in your curb appeal. Re-paint the door, add a few Consider these factors when weighing your decision: potted plants, and upgrade your mailbox and address numbers. Mortgage rates. Would your mortgage rate increase if Add a fresh coat of paint. Paint over bold and bright wall you were to buy a new home? colors with a simple white or eggshell. It looks cleaner and offers Renovation scope. How much would you need to do to more possibility. your home to achieve the look you're hoping for? Get new pillows and throw blankets. Add a few colorful or How much would it cost? patterned pillows and transform your old furniture instantly. Local market. What do housing prices look like? Rearrange. Move furniture from room to room and floor to floor, Long-term goals. Are you in a location you're happy creating entirely new looks throughout. with for the long-term? Interior design doesn't have to be a huge investment of time Not sure if now is the right time to buy or sell in your area? and money. Get creative and re-use what you already have. The Contact me to receive up to date hyperlocal real estate market information. right arrangement and decor can give your property a competitive edge. _____________________________________________________________________________________ EVERYDAY HEROES REBATE When selling a home with Amani Warden, Everyday Heroes receives 25% rebate of her commission! Everyday Heroes are doctors, teachers, law enforcement, nurses, firefighters, and others who make our communities better places to live. the right Realtor can save you thousands! www.TampaBayMove.com www.klehmer.remaxagent.com 5 Star Review! The Eye Specialist You TRUST, a Practice REIMAGINED. TAMPA LMOLOGIST TOP OPHTHAted by as vo physicians! Terrace Smiles is located at 13214 Telecom Drive, Temple Terrace, FL 33637. For more information, including a new patient internet special ($99 for an exam, cleaning, consultation and digital x-rays), visit TerraceSmiles. com or call (813) 977-7000. APRIL Plantings & Lawn Maintenance Plan to beautify your landscape with these tips for what to plant in APRIL and lawn maintenance measures! Excerpts are taken from http://edis.ifas.ufl.edu courtesy of University of Florida IFAS Extension. Annuals: New varieties of coleus do well in sun or shade and provide vivid colors and patterns for months. Bulbs: Planting early-, mid-, and lateblooming varieties of daylily ensures months of color from these low-maintenance plants. Herbs: Add nasturtiums to your herb garden. The leaves and flowers add a peppery zest to salads. Pests: Monitor landscape plants weekly for aphids on tender new growth. Flowering plants: Check for thrips if leaves and/or flowers of gardenias and roses are damaged. Perennials and bulbs: Divide clumps of bulbs, ornamental grasses, or herbaceous perennials to expand or rejuvenate garden beds or to pass along to friends. Lawn insects: Rule out cultural problems, such as lack of water, that resemble insect damage before applying a pesticide. Lawns: Apply fertilizer after new growth has started which is usually early April in north-central and central Florida, Choose a fertilizer (not a "weed and feed") with little or no phosphorus unless a soil test indicates the need for it. A fertilizer with controlled-release nitrogen yields longer-lasting results. Shrubs: Choose from a wide variety of shrubs to add to the landscape now. Mulch: Add mulch to minimize weeds and conserve moisture during dry weather. Organic mulches add nutrients to the soil. 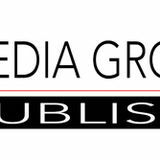 KEM Media Group magazines and Live newsletters are a key component in many Multiple businesses’ marketing Publicat io plans and have consistently Discount n delivered excellent results for Availabl s many advertising campaigns. e! Aside from an extensive hard-copy readership, the publications are all placed online at www.KEMMediaGroup.com.